Note: In the booklet, the paragraphs about Jones Community College and Camp Shelby were disconnected from the rest of the text in a way that made sense in a bound paper booklet, but didn’t in a digital format, so I’ve moved those paragraphs to be geographically correct. U.S. Highway 11 runs diagonally across the southeastern corner of the State through the swelling ridges and red clay hills of east central Mississippi; and at the southern end, where it junctions with U.S. 90, passes across a small part of the Coastal Meadow. In the vicinity of Meridian, where U.S. 11 begins its swing across the state, great hills with unbroken forests of longleaf pines crowd to the edge of the highway. Then, almost abruptly the route breaks from the forest into the country where most of the great forests have been completely cut out. Southwest of Laurel and Hattiesburg the land shows the efforts of the people to meet the problems left by a dying lumber industry. 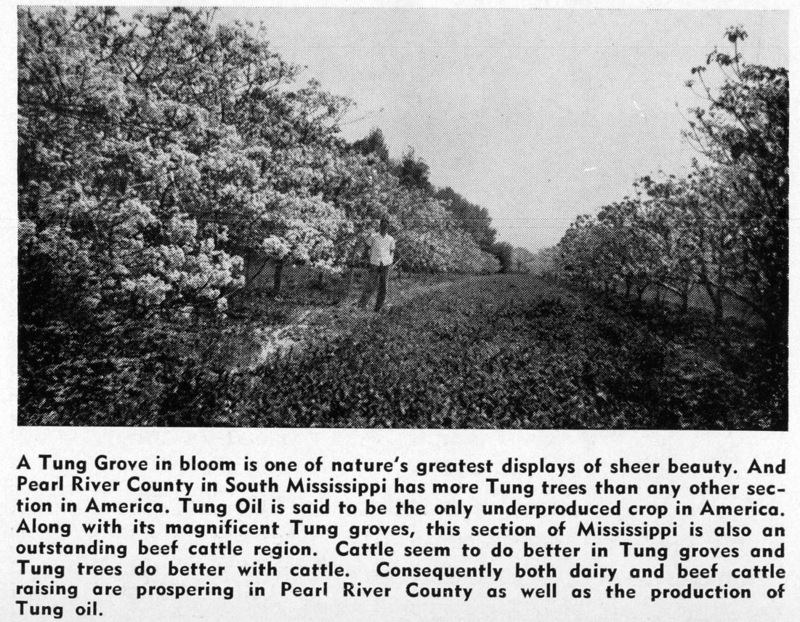 In place of the pines are seen orchards of pecan, tung and satsuma trees. Between Poplarville and Picayune is concentrated the tung oil production of the State. In the spring, when the waxy white blossoms stretch mile after mile along the highway, the landscape resembles a Chinese countryside rather than a Southern state. At the southern end of the route the land drops noticeably into the flat, marshy meadow bordering the Coast. 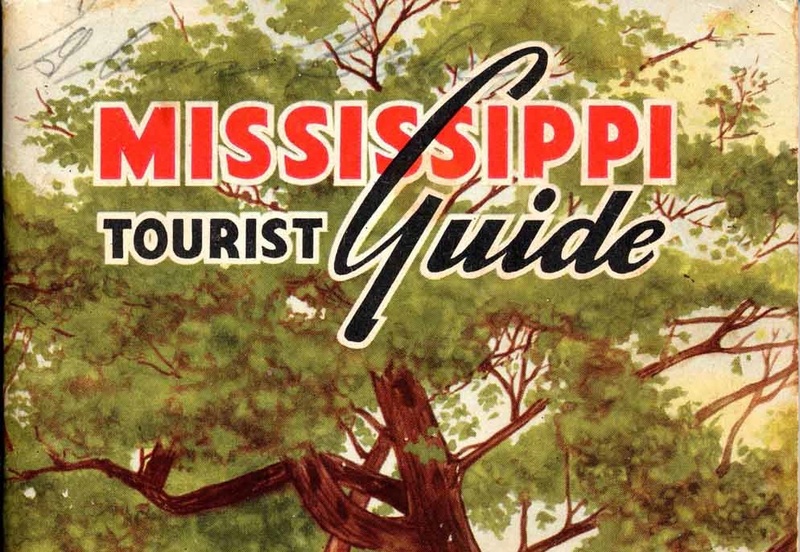 Here, the vegetation takes on a tropical look and the tourist realizes that he is in the vicinity of the South’s famous resort center, the sunny Mississippi Gulf Coast. Meridian, second largest city in the state, is an important railway and highway junction point. Here, U.S. 11 begins its winding course through beautiful pine hills down to Enterprise and Stafford Springs, two typical woodland towns. Laurel, 58 miles below Meridian, is a model of progress and diversification which have served to maintain the prosperity of this wide-awake community. Between Laurel and Hattiesburg is Ellisville, one of the county seats of Jones County. Jones County Junior College located at Ellisville is one of the most progressive institutions of higher learning in the State. In proportion with its steadily increasing enrollment, the physical plant of the school and its faculty have been expanded and today it is recognized for its superlative and exceptional educational facilities and record. Below Laurel U.S. 11 comes to Hattiesburg, site of Camp Shelby, Fourth Corps Area Army Camp. Camp Shelby, located 10 miles from Hattiesburg on Highway 49, and only 65 miles north of the famous Mississippi Gulf Coast, is one of America’s finest and largest military training camps. A two-division camp, its personnel totals approximately 58,000 soldiers–second largest camp in point of numbers in the United States. 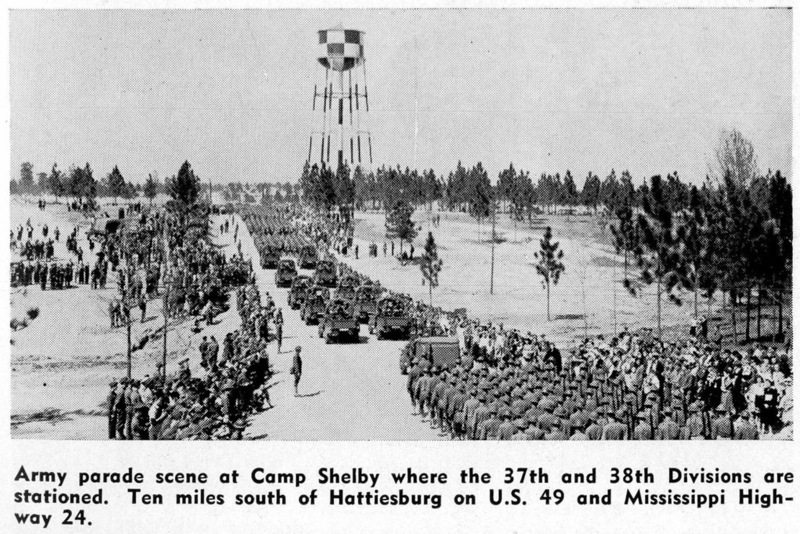 During the World War Camp Shelby won the enviable reputation of being the most healthy of American military camps. That record is being maintained today. While Camp Shelby served as a receiving center for Mississippi selectees and volunteers, most of its personnel comes from the Middle West with large contingents from Ohio being located there. Lumberton, 25 miles southwest of Hattiesburg, still retains the atmosphere of a thriving mill town, although the industry that gave the town its name no longer exists in any great degree. Poplarville, the next stop south, is the location of Pearl River Junior College. This town is well known for Senator Theodore Bilbo’s “Dream House,” built a few miles out from the town. Flanking the highway for miles between Poplarville and Picayune, Mississippi’s tung oil capital, are row upon row of these beautiful oriental trees. Picayune, center of the tung oil industry and last important stop on U.S. 11 before it junctions with the “Old Spanish Trail“(U.S. 90), was formerly a sawmill town. The development of tung oil culture has allowed this progressive community to continue its growth and prosperity. More about Highway 11 and other Mississippi highways . . . Considering it is mentioned in every account of Poplarville, no one seemed to take any photographs of Theodore Bilbo’s “Dream House.” The only photograph I have ever seen of it is this 1935 Associated Press photo in the New York Public Library Digital Collections, which is focused on Bilbo and his guests. One can see that it was a large house. I know! Isn’t that strange? You would think he would have had photographers out there all the time showing off his “Dream House” for the public. I don’t recall ever seeing this picture, but it’s a good one to illustrate that while Bilbo famously paid $40 for 40 columns from the Old Capitol, they were never used (as recounted by A.S. Coody, assistant secretary to the Capitol Commission in 1949: https://misspreservation.com/2017/02/10/misspres-at-8-bilbo-got-our-columns-for-a-song/) Bilbo’s are Tower of the Winds, which doesn’t appear in the O.C., at least not in this stripped-down, twentieth-century iteration. Plus, if the house wasn’t designed with just the O.C. columns in mind, I suppose fitting them would be tricky. From Chester Morgan’s book, the sale of the columns went through a public bidding process. Bilbo was known to have a fetish for acquiring architectural salvage. That probably explains Mr. McCarter’s holding onto to Miss Kate’s house(along with the baby grand piano in the foyer) in Crawford, allowing it to die by neglect. There are several photos of Dream House I&II in Bilbo’s Photo Collection. I really love the first paragraph of this highway description. It seems to me that whoever wrote it was a Piney Woods native, or at least had lived in the region long enough to really love its unique ecology. Surprised they mentioned Stafford Springs (or Enterprise), but that was one of my favorite places to go as a child. Also Lake Bounds just a few miles east of Hwy 11.
highway 11 in the ‘highways’ book slipped by me because of some other ‘less-than-pleasant’ goings-on here in lyons, but, glad to see it. of course, hattiesburg had gotten its main mention when highway 49 was discussed. a comment on bilbo’s ‘dream house’, which my maternal grandparents visited on several occasions. am not certain of its construction date wtithout doing some research(20s? 30s? ), but it burned in the fall of 1947–so, no, i didn’t see it since i didn’t ‘appear’ til december, 1947! i know i have seen some better photos of the house–but, this was many years ago—possibly in an article in the hattiesburg american newspaper. that data is packed up in files that are currently inaccessible, alas.. but, it was ‘classic-colonial’ in style, with a wider than usual center hall–note that there are three openings, not just one, under the portico–and, the front porch mixed large tower of the winds columns with tuscan. i think that there was a porte-cochere on one side, but i can’t remember exactly–maybe i confusing the large, extended front portico with a porte-cochere in my memory, however. maybe a jackson or new orleans architect? i haven’t done extensive study of the early 20th century use of the tower of the winds corinthian order, but yes, it had some renewed ;popularity then—it appears in the original administration building at usm , at the tatum home- ‘pinehurst’–in hatttiesburg, and at the remodeled ‘monteigne’ in natchez.